The efficacy of vaccines is greatly affected by physical conditions, especially ambient temperature, to which they are subjected during transportation and storage. Although a few vaccines retain their potency after undergoing relatively wide temperature variations, most lose their potency, especially the live vaccines. To these vaccines, the cold chain system is very important to provide the optimum conditions during storage, transportation, or distribution. The cold chain system ensures that the vaccines are kept at the optimum temperature right from the point of manufacture down to distribution at the primary health care (PHC) levels. Vaccine-preventable diseases are a major contributor to child morbidity and mortality, especially in Sub-Saharan Africa and Nigeria in particular. It accounts for 17% of global total under-five mortality per year and 22% of child mortality in Nigeria, and as such, this system is necessary as vaccine failure may occur due to failure to store and transport them under strictly controlled temperature conditions. This is of concern in view of the fact that there have been reported epidemics of vaccine-preventable diseases in populations thought to have been fully immunized. Maintaining vaccines perfectly preserved from its manufacture through administration requires an adequate cold chain infrastructure, compliance to standards, and effective management. At the end of the chain, PHC providers must have adequate knowledge to manage the cold chain., Maintaining the vaccine cold chain is an essential part of a successful immunization program because vaccines lose their potency easily. Healthcare workers play a vital role in cold chain management, and so it is pertinent to assess their knowledge, attitude, and practice. Today, with the availability of more expensive vaccines, it becomes paramount that the knowledge of health workers on cold chain management be assessed to avoid costly wastages that are bound to result from inappropriate practice as a result of poor knowledge. An often neglected issue requiring close assessment is the knowledge of the people charged with the responsibility of ensuring an uninterrupted cold chain at the operational level and their attitude toward maintaining cold chain. This is the realm within which this study is intended to be. In this part of the world, as in many tropical areas where the high environmental temperature is a problem, cold chain managers' struggle with keeping the vaccines away from heat. Poor understanding of the dangers of vaccine freezing contribute to the weakness of the existing cold chain in many countries. Emphasis has long been placed on keeping vaccines cold, with less attention devoted to prevention of vaccine damage from freezing. Freezing of vaccines in the cold chain is commonplace, potentially resulting in the widespread delivery of vaccines whose potency has been compromised. Vaccine exposure to temperatures below recommended ranges in the cold chain may decrease vaccine potency of freeze-sensitive vaccines leading to a loss of vaccine investments and potentially places children at risk of contracting vaccine-preventable diseases. Studies that focus on cold chain management of vaccines in northern Nigeria are limited. As a result, this study aims to assess the knowledge, attitude, and practice on the cold chain management of vaccines of healthcare workers in Giwa, Northwestern Nigeria. Giwa Local Government has three districts, 11 political wards. It has one tertiary hospital, a general hospital, 17 PHCs, 28 health centers, and 9 private clinics. The PHC facilities have a total staff strength of 302 (technical and nontechnical). Technical staff were 168 and were made up of nurse-midwives, midwives, community health workers, community health extension workers (CHEWs), junior CHEWs, pharmacist technicians, pharmacist assistants, laboratory technicians, and laboratory assistants. This descriptive, cross-sectional study was conducted among PHC workers in Giwa local government area (LGA) of Kaduna state. PHC workers involved in vaccination for a minimum of 6 months. The sample size was determined using the formulan = (Z2 pq)/d2, where P is the prevalence of knowledge on cold chain management from a previous study (0.14).Z is standard normal deviate at 95% confidence level, q is the complementary probability (1-p) and d = degree of accuracy desired at 95% confidence interval, = 0.05. Also applying the formula for sample size when the population is <10,000, nf = n/(1 + n/N), a final sample size of 78 was obtained. A multistage sampling technique was used to select the respondents. From the list of PHC facilities, one PHC facility was selected from each of the 11 wards using simple random sampling by balloting. At each of the selected PHC facilities, eligible healthcare workers were selected using proportionate sampling method to obtain the sample size. Permission was obtained from the PHC coordinator of Giwa LGA and from the supervising heads of the PHC facilities before the study was conducted. Information about the study was provided to each respondent, following which written consent was obtained from each respondent. A pretested, structured, interviewer-administered questionnaire was used to collect data. Data were collated and analyzed using International Business Machines SPSS Statistics for Windows, Version 23 (IBM Corp., Armonk, NY, USA). The knowledge questions were scored one mark for each correct answer, while incorrect or “don't know” responses were scored zero. The scores were added up and the percentage scores were obtained. The scoring system then graded knowledge as 0%–33% for poor, 34%–66% for fair and 67%–100% for good. For the questions on attitude, the five-point Likert scale was used with responses from strongly disagree to strongly agree. Each question on attitude had a score that ranged from −2 to +2, moving from less to more favorable attitude score. For positive statements about healthcare workers attitude toward cold chain management, a maximum score of ±2 was assigned to the strongly agree option whereas for statements that capture negative attitude a maximum of ±2 was assigned to strongly disagree option. The maximum possible score for attitude was 20. Scores of 10 points and above (≥50%) were regarded as a positive score <10 points (<50%) was regarded as a negative score. Practice score was assessed using 10 questions, each correct response was assigned a score of 1 while wrong response, a score of zero. A respondent has appropriate practice if the total score was 50 and above and inappropriate practice if the total score was <50. A total of 78 questionnaires were administered and all were completely filled. This gave a response rate of 100%. The mean age of the respondents was 35.1 ± 8.9 years. CHEWs made up the highest proportion of respondents (42.3%) and 55.1% were male. The respondents mean duration of work experience was 2.5 years, though 62.8% had worked for between 1 and 10 years. Only 57.7% had been trained on cold chain management and 77.8% was more than 6 months before the study [Table 1]. Majority of the respondents (87.2%) knew that temperature changes alter vaccine effectiveness. Most respondents (91.0%) were aware that vaccines should be maintained at a particular temperature range, but only 69.0% knew the correct temperature range of 2°C–8°C [Table 2]. Majority of the respondents (76.5%) and (74.2%) knew that PENTA and hepatitis B vaccines, respectively, can be damaged by freezing. On ways vaccines can be damaged, exposure to light was the most common response (89.4%). 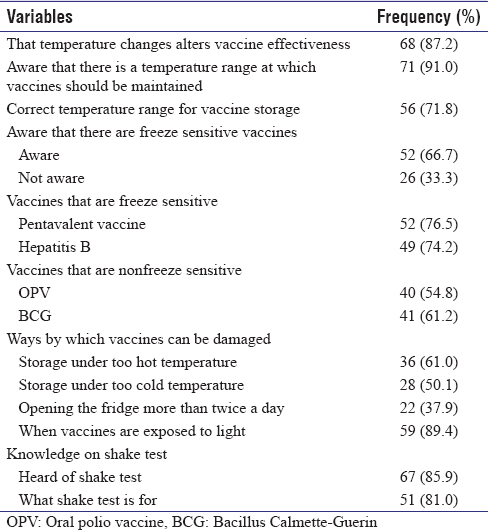 The majority (85.9%) of the respondents were aware of shake test and 81.0% of whom knew that shake test is for checking if a freeze sensitive vaccine has been subjected to freezing temperatures [Table 2]. Only (3.8%) of the respondents had good knowledge on cold chain management [Table 3]. About half of the respondents (51.3%) strongly agreed that vaccines in the refrigerator should be regularly monitored. A third (29.5%) strongly disagreed with putting vaccines with drugs, food, and reagent. With 41.0% strongly agreeing that staff training in cold chain delivery system is important [Table 4]. Majority (78.5%) of the respondents had a positive attitude toward cold chain management [Table 5]. Only above half of the respondents (55.1%) said that vaccines were stored in their health centers. Majority (97.7%) stored vaccines for a month or less and 83.7% of the respondents always checked the temperature of the refrigerator before removing the vaccines. Most (81.4%) respondents did not keep other items such as drugs, reagents, or food in the same refrigerator with vaccines. About half (55.8%) of the respondents had conducted a shake test in the past 3 months. More respondents (53.5%) assessed the power supply to their health centers as poor. About half the respondents had appropriate self-reported practice on cold chain management [Table 6]. About half the respondents had appropriate self-reported practice on cold chain management [Table 7]. This study showed that most respondents (91%) were aware that vaccines should be stored at a particular temperature range, but only 71.8% knew the correct range. 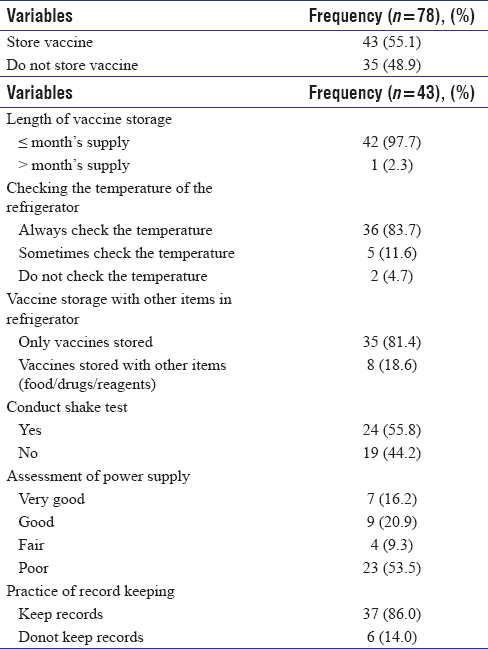 In a study in Niassa, Mozambique, just over half the respondents knew the correct temperature range for storage of vaccines. The difference found between this study and the Niassa study could be due to a higher proportion of trained health workers in this study. All health workers should know the temperature range for storing vaccines. Vaccines are sensitive biological products and if exposed to the inappropriate temperature they would lose their potency and once potency is lost it cannot be regained. About two-thirds of the respondents in this study were aware of freeze-sensitive vaccines. This is lower than what was found in a study in India. Most of the cold chain handlers in the Indian study were aware of freeze-sensitive vaccines which could be accounted for by 86% of them having been trained. In this study 60.1% and 50.5% of respondents knew that vaccines could be damaged by heat and freezing, respectively. This is lower than what was observed in the Kelantan study were majority of the respondent knew that vaccines could be damaged by heat and freezing. The correct storage of vaccines is crucial as both too low and too high temperatures can cause damage to specific vaccines. In this part of the world, where the high environmental temperature is a problem, in trying to keep vaccines away from heat, the tendency is that of exposure to freezing temperatures with the skewed belief that low temperatures pose no problem at all. If, at any time in the cold chain, vaccines are exposed to temperatures outside of the defined range, irreversible damage can occur, resulting in loss of product. Administering vaccines that have lost their potency will lead to failed immunization against vaccine-preventable diseases. Of the 85.9% respondents who were aware of shake test, 81% knew that it is a method used to detect whether absorbed vaccines have been affected by freezing. More than two-thirds of health workers in a study in north-central Nigeria were aware of Shake's test as a test for detecting if vaccines had been previously frozen. When a vaccine is damaged by freezing, the potency lost can never be restored. Freeze-damaged vaccines have lower immunogenicity and are more likely to cause local reactions like sterile abscesses. The success of cold chain management could depend on the attitude of handlers. This study showed that the attitude of the PHC workers was positive (78.5%). This is similar to a study done in China where 80.1% of the respondents had a positive attitude toward cold chain management, but in contrast with a study done in Kelantan, Malaysia where only a fifth (20.2%) of the respondents had a positive attitude toward cold chain management. This study also showed that 44.5% of the respondents agreed that cold chain delivery system is affected by harsh weather and poor equipment. This is lower than the study in China where 59.9% of respondents believed that cold chain delivery system is affected by difficult service delivery 87.7% due to geographical factors and poor condition of cold chain equipment. In this study, 46.2% of the respondents agreed that refrigerators containing vaccines should not be opened more than 3 times a day. This is in contrast with the study in Kelantan, Malaysia where 75%–85% could not be bothered if the refrigerator is opened more than 3 times a day. Less than a third (28.2%) of the respondents believed that keeping vaccines with food, drinks, and laboratory specimen in the same refrigerator will not cause damage them. This is higher than the Kelantan study, where only 4.5% believed they could place vaccine with food, drinks, and laboratory specimens. This shows that respondents were aware of the potential damage that not having a refrigerator dedicated to vaccines could cause. About 50.6% of respondents agreed that putting vaccines in a refrigerator door shelf could damage vaccines. This is in contrast with a study in Kelantan, Malaysia where only 11.2% of respondents believed that placing vaccines in a refrigerator door shelf could damage vaccine. The respondents in this study that reported that temperature reading should be taken inside the refrigerator were about half while only a few of the respondents in the Kelantan study reported same. Only 2.3% of respondents said more than a month's supply of vaccines was kept in their health facility. This is lower than a study in South Africa where 47.1% of the respondents kept more than a month's supply in the refrigerator. This might be due to poor power supply to the health centers reported by respondents in this study. Majority of respondents in this study did not keep items like drugs, reagents or food in the same refrigerator. This is similar to a study in South Africa where of the respondents agreed that no food or drinks were ever stored in the refrigerator. Most respondents kept records routinely. This is similar to a study in South Africa, where a majority of the respondents kept stock cards for vaccines. Just over half (54.7%) of the respondents had conducted a shake test in the past 3 months. This is lower than what was found in a study in South Africa, where 71.0% of the respondents had conducted a shake test to identify frozen vaccines. This implies that freeze-sensitive vaccines that are frozen might go undetected, leading to children been vaccinated with vaccines that are not viable. About half the respondents in this study had appropriate practice (51.3%). This is lower than a study in Australia where 76% of the respondents had appropriate practice. Only 3.8% of the respondents had good knowledge of cold chain management, however, most had positive attitude toward cold chain management and more than half had appropriate practice. Primary healthcare workers must have good knowledge and regular in-service training on cold chain management. We wish to express our gratitude to the chief medical director, heads of departments, chief matron and matrons in charge of wards of ABUTH for their cooperation. We also wish to thank the healthcare workers for consenting to participate in this study. Yakum MN, Ateudjieu J, Walter EA, Watcho P. Vaccine storage and cold chain monitoring in the North West region of Cameroon: A cross sectional study. BMC Res Notes 2015;8:145. World Health Organization, UNICEF, World Bank. State of the World's Vaccines and Immunization. 3rd ed. Geneva: World Health Organization; 2009. Available from: https://www.unicef.org/immunization/files/SOWVI_full_report_english_LR1.pdf. [Last accessed on 2016 Nov 28]. Balding B. Mandatory Vaccination: Why we Still Got to Get Folks to Take their Shots; 2006. Available from: https://www.dash.harvard.edu/handle/1/8852146. [Last accessed on 2016 Nov 28]. Milstien JB. Temperature Sensitivity of Vaccines. Service Temporary Down; 2006. Available from: http://www.whqlibdoc.who.int/hq/2006/WHO_IVB_06.10_eng.pdf. [Last accessed on 2016 Dec 01]. Cliff J, Simango A, Augusto O, Van Der Paal L, Biellik R. Failure of targeted urban supplemental measles vaccination campaigns (1997-1999) to prevent measles epidemics in Mozambique (1998-2001). J Infect Dis 2003;187 Suppl 1:S51-7. Omalibu O, Nwaeke AC, Audu RA, Akinyemi KO, Salu OB, Muller CP. Evaluation of measles vaccine cold chain in Lagos, Nigeria. Afr J Clin Exp Microbiol 2007;8:1-7. World Health Organization. Mid-Level Management Course For Epi Managers-planning immunization activities at national, provincial and district levels. WHO Regional Office for Africa 2004. Pillay S. Descriptive Study into the Cold Chain Management of Childhood Vaccines by Nurses in Prmary Health Care Clinics in the uMgungundlovu District; 2014. Available from: http://www.hdl.handle.net/10321/1249. [Last accessed on 2016 Dec 02]. Protocol for evaluating freezing in the vaccine cold chain. Program for appropriate technology in Health, April 2003. Available from: https://path.azureedge.net/media/documents/TS_cc_protocol.pdf. [Last accessed on 2017 Nov 10]. Hanson CM, George AM, Sawadogo A, Schreiber B. Is freezing in the vaccine cold chain an ongoing issue? A literature review. Vaccine 2017;35:2127-33. Ibrahim T. Sample size determination. Research Methodology and Dissertation Writing for Health and Allied Health Professionals. Abuja (Nigeria): Cress Global Link Limited; 2009. p. 75. Bankole AM, Olusegun K, Bankole M, Iboma G, Adebowale OA, Lukman AJ, et al. The impact of health facility monitoring on cold chain management practices in Lagos, Nigeria. J Public Health Epidemiol 2010;2:78-81.
de Timóteo Mavimbe JC, Bjune G. Cold chain management: Knowledge and practices in primary health care facilities in Niassa, Mozambique. Ethiop J Health Dev 2007;21:130-5. World Health Oganization. The Vaccine Cold Chain. Available from: http://www.who.int/immunization/documents/IIP2015_Module2.pdf. [Last accessed on 2017 Jan 08]. Mallik S, Mandal PK, Chatterjee C, Ghosh P, Manna N, Chakrabarty D, et al. Assessing cold chain status in a metro city of India: An intervention study. Afr Health Sci 2011;11:128-33. Azira B, Norhayati MN, Norwati D. Knowledge, attitude and adherence to cold chain among general practitioners in Kelatan, Malaysia. Int J Collab Res Med Public Health 2013;5:3-11. Ameen HA, Salaudeen AG, Bolarinwa OA, Uthman MM, Musa OI, Aderibigbe SA. Vaccine storage and handling practices among routine immunization service providers in a metropolitan city of North-Central Nigeria. J Community Med Prim Health Care 2013;26:18-28. Kartoglu U, Ozgüler NK, Wolfson LJ, Kurzatkowski W. Validation of the shake test for detecting freeze damage to adsorbed vaccines. Bull World Health Organ 2010;88:624-31. Zhang X, Wang L, Zhu X, Wang K. Knowledge, attitude and practice survey on immunization service delivery in Guangxi and Gansu, China. Soc Sci Med 1999;49:1125-7. Carr C, Byles J, Durrheim D. Practice nurses best protect the vaccine cold chain in general practice. Aust J Adv Nurs 2004;27:30-40.